Our mediatiors are here to answer any questions you may have, Contact us today! This simple guide to divorce will help you to dispel some of the myths surrounding divorce. We aim to make the process transparent and easy to understand and here we provide our very own ‘mythbusters’ that can help you to make divorce quick, easy and painless. In any case, please contact us as our mediators will be happy to help with your questions and queries. A: This is not necessarily the case. Unless a solicitor has drafted a consent order, there is the potential to make legal claims against the assets of the other party for years after you have been divorced. Q: If my ex-partner does not pay their child maintenance I can keep them from seeing the children. A: This is not the case, the two things are quite separate from a legal perspective. Only the Child Support Agency can help you initially in terms of unpaid child maintenance. You can not use the threat of not seeing children as an incentive for your ex-partner to pay child maintenance. Q: Adultery means that the cheating party has to pay more. A: Very rarely is this a case for the court to award a higher payment. In some cases, the person who has committed the adultery will have to pay a notional charge for court fees. Q: Anyone who is divorcing has to attend court. A: This is very unlikely – you may never have to set foot in a court. Q: I don’t want to get divorced – my ex-partner can’t force me. A: Of course, you can oppose the divorce but there is no legal precedent for a court maintaining that a couple must stay married if one partner does not wish to maintain the relationship. If one party wants to get divorced, there is really no escaping that fact, and you should obtain legal advice of your own. Q: The children’s Mum will get custody. A: This is not necessarily the case. As circumstances change, it is likely that the Father will have more of a role in this. Q: As a Father, will I only see my children every other weekend? A: This has become somewhat of a cliché but this is just one of several different childcare arrangements that can be agreed upon. We find that the majority of parents agree on a time sharing split. Q: I need a solicitor. A: Not necessarily, you could do your own divorce. However, to gain a consent order you need a solicitor. Q: It is a matter of how much money you pay. A: No, the court deal with divorces in strict order. Q: Not everything counts as a joint asset. A: Lottery winners are not immune from sharing their winnings after divorce. The house can also be considered a shared asset even if the mortgage is in the name of one party. 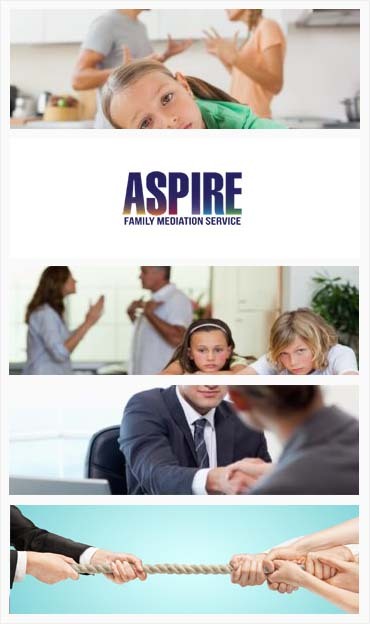 Contact Aspire today for help with divorce and separation issues.